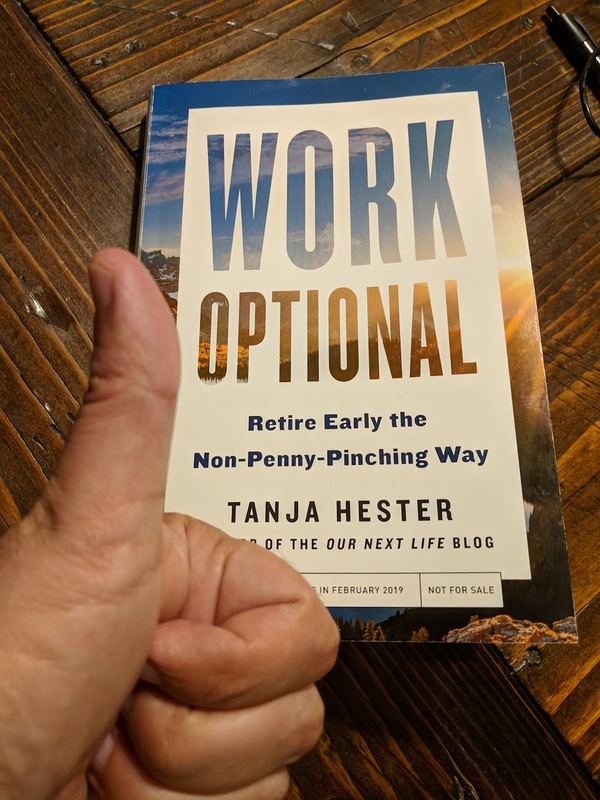 Inspiring, thoughtful, and detailed to the point of wondering if a book can be too well researched, Tanja Hester's Work Optional examines financial independence and early retirement with a scope that sets the book apart. This easy read can surely introduce "FIRE" to a newcomer, while forcing long-time enthusiasts to question how well they've really thought their early retirement plans through. Engaging and thought-provoking throughout (no small feat considering most people will get up and walk out of a room to avoid a discussion about money), Work Optional deserves a spot beside A Simple Path to Wealth: the two books you should share with a friend or coworker asking what this whole financial independence thing is about. There are checklists at the end of each chapter, but these feel less like busy work and more like truly helpful suggestions: reminders to spend some time pondering the things that matter if you want to create a plan that works. Work Optional has good, well-researched sections on investments, safe withdrawal rates, and frugality, of course. These are the financial foundations of an early retirement and no book on the subject should be written without them. But Hester shines in the spaces that go beyond showing readers how to achieve financial independence, in the pages where she invites the reader to question why he or she wants to pursue this sort of life in the first place. Avoiding the temptation to paint early retirement as a panacea, Hester discusses the material costs of retirement, which can be significant. Citing Robert Weiss's The Experience of Retirement, Hester notes that "there are very real losses that come from retirement, most notably a loss of community, life structure, and personal identity." The book also cites research finding that couples "tend to experience an increase in conflict during the first year or two after retirement." Out of context, these quotes might make it seem that Hester is down on retirement itself, and instead leans more into the financial independence side of FIRE. But that is not the case here. As she does throughout the book, Hester takes a straightforward look at each aspect of the transition away from work: emotional and physical well-being, leaving work without a clear plan, stress on relationships, the possibility of underestimating medical costs. She shares the potential downsides precisely so readers can better prepare for them: so your next life will be as joyful as it can be. That last part is critical. At its core, Work Optional seems to be more about life design than it is about personal finance. This is a fairly common theme in FIRE circles, but one which its leading voices have often struggled to articulate. When early retirees are branded as penny pinching, money-hoarding nerds, the blogger's response is typically to insist this goal is not at all about money, but instead is about...something else. It's really about freedom or happiness or some other good-sounding-but-hard-to-express goal. I've always thought that FIRE had a branding problem. Just take a look at any comment section in a mainstream publication. A concept that so many workers fantasize about each Monday morning shouldn't be that hard to pitch to those same workers. Hester tackles that branding problem as well as anyone, save perhaps Mr. Money Mustache (who saw early on that it was better to go with "badassity" instead of frugality). Rather than stopping at the clichéd take that financial independence gives you "the freedom to do whatever you want", Work Optional nudges readers to figure out what that next life looks like, in a real way, and for themselves. What does your ideal day look like? What setting are you in when you imagine this day? What do you think will provide a sense of purpose in your new life? How can you maintain relationships and stay connected socially? What does your partner want out of all of this -- are his answers similar to yours? My gut says that Hester believes the key to loving life in your second act are found in those answers and, somewhat ironically, in the aspiring early retiree's commitment to put in the work. As someone who often balks at putting in maximum effort, this is not an approach to early retirement I initially thought I would like. But as with most things I procrastinate about, it turns out the effort involved with self-reflection is not as awful as my fear of it. Below is a very fancy visual of the themes and activities we want to build our next life around. 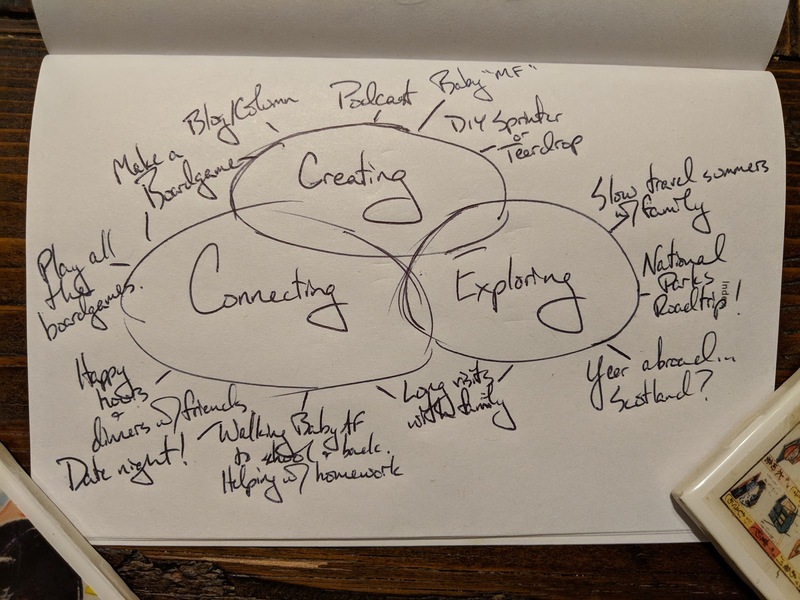 Amazingly, even after writing about financial independence for over six years, I'd somehow neglected to put these sort of life goals into a cohesive plan. I suspect my experience is not all that unique. With so many people on the path towards financial independence or early retirement, but relatively few who have already made it, there simply aren't all that many helpful, detailed guides to what the process entails, beyond the basic financial aspects. Work Optional certainly is one. If you are contemplating an early retirement, you would be doing your future self a favor if you picked up a copy. We definitely fall in the camp of working on FIRE by 40, but have no idea what life will look like after we reach FI. I, also, feel like it's so far away (11-12 years away based on our age). My husband, also, doesn't know...other than he doesn't want to be stressed and he wants to play lots of video games. I feel like our FI paths have a lot in common, SFL. Removing stress from my life was a big initial goal, maybe THE goal, when I first decided we wanted to reach financial independence back in 2011 or so. (I also love video games & boardgames.) I guess that would put us on a 10 year plan. For what it's worth, Tanja's book was the first that got me to really start defining, in more detail, the life we wanted to have post-FI. I'm really impressed with how much ground she was able to cover, getting down into the nitty gritty. Excellent piece, Done by forty. You inspired me to pin down all those self-reflection tasks that I've been neglecting for a while. These are "to be defined" but in fact it's better to define them now. More importantly, you inspired me to write a monologue post about rethinking FIRE. There are downsides and one needs to consider how to best transition in order to tackle them before they become a reality. In software development we have a term called "agile". It means that changes are introduced iteratively and are being monitored before introducing more of them. That's better compared to a Big Bang. You see where I'm going with this! Good luck to your journey and thanks for writing this post. I work in IT procurement so I'm somewhat familiar with agile: ver cool application of that process here. I think many FIRE enthusiasts would benefit from that sort of rigor. Thanks for stopping by and commenting, Michael! Great point about wanting to reach FI but not having concrete plans and goals. I fall into that boat as well. Sure, everybody wants more free time and not HAVE to deal with office politics, lousy commute, annoying co-workers, bad bosses, etc. But without a plan as to what you want for your "next life" then you run into the problem of dissatisfaction living that next life. Reaching FIRE won't cure all that ails you. So good job on writing those plans and goals out. P.S: you have great handwriting haha. I think you and I have a very similar approach to FI, both in the way we think about it and even some of our investments. Though I certainly hope your RE plans pan out better than ours did! Between now and 40 I really want to keep thinking about this next life, as Tanja puts it. I liked this book review as you seemed impartial - not gushing like it was a friend who asked a favour, but also not scathing for the lols. Coincidentally, I read about FIRE and dream about it. But I don't invest in shares. My goal has been solitary in: pay off my home. And alas, that was all set to happen in 2019. But contracts end - and this one was cut short. The short cutting is not too bad - cause I have a huge buffer of cash, which is used against my mortgage (here in Australia, offset accounts are common, and reduce interest paid on mortgages). It's only a week and a bit in, and whilst I haven't rushed to apply for jobs, I do have clarity that I will work again, and in part, as I know I can't 'not' for the reasons she indicates - I like the social capital my job has, the acclamation and praise from work. My goals, too, are more outlandish than yours in financial terms, but also not. I like to travel to places, but a few weeks at a time. As a single person, I tick off a few places year on year. It's not for lack of time, but that seasonality and life. Last year, two international trips were dictated by the calendar - a birthday surprise and Christmas. Somehow, I had another trip wedged between those two, to Europe. As a Godmother at a baptism. I loved my contract meant: no work, no pay. And I had no hesitations to take the time to do any of these trips. It worked well for me. I almost 'worry' about a 'normal' job. Forgetting that leave without pay is possible anywhere, though somewhat unconventional. My funemployment has also taken to routines and some structure: gym, b'fast, coffee at a cafe where I read the newspaper cover to cover. From there, wash up, errands and chores. A coffee date with professional contacts. Occasionally a 'first' date romantically. Napping. Reading. It's been very chilled. Love a mind map, especially hand drawn! Hi there, Sarah! Always so nice to hear from you! I'm sorry about the contract being cut short but it sure seems like you planned well for it. We paid off our mortgage at our first home but after a few years, we up and took out a mortage again...and now with this home, we have a ridiculous (for us) and expensive mortgage which I have mixed feelings about. We go back and forth about whether to pay it off. Maybe you can advise us a bit: what motivates you to be totally be debt free? And I dig your take on leave without pay. I hadn't thought about it being somewhat motivating but I can see that. For us, we get about five and a half weeks a year time off from my job and TBD with Mrs. Done by Forty's future work situation. But I sure like the idea of taking off for a few months a year and seeing places at a shorter pace. I'm not in a position to FIRE (or even just reach FI before retirement age), but it's great to see books demystifying the process so that more people (hopefully) decide to make more purposeful steps toward being responsible -- and purposeful! -- with their money. I hear you, Abigail. It's good to demystify the process, while acknowledging that FIRE really is not a goal that everyone can or wants to achieve. I think Tanja does as good a goal of that as anyone. Like you said, it is about steps towards being purposeful and responsible with money. Progress not perfection. Great review! I cant wait to read it but think it may take a while to filter through into UK libraries. Hey there, Little Miss FIRE! It's a great book and it will be worth the wait to get to the UK libraries (and also worth the ten dollars or so if you wanted to purchase). Maybe I should do a giveaway with my copy? It really is a good read, which is not always the case with FIRE content. Many of us bloggers (myself included) should work on our craft a bit more, unfortunately. But that's not the case with Tanja.